The sea was much calmer for our return visit to Ha’afeva, we planned to stay overnight on Saturday to break the thirty five mile trip down to Nomuku Iki. We were pleased to find the bouncy anchorage of just a week ago was now pleasantly smooth. 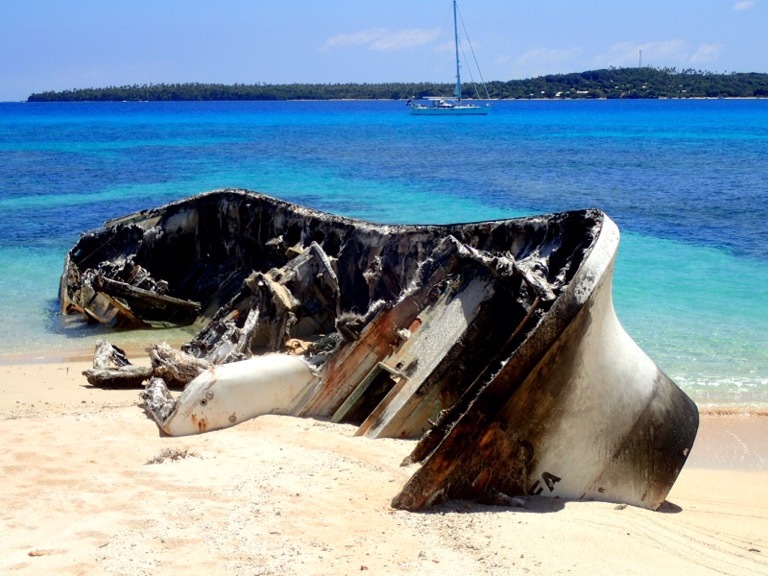 At low tide, revealed on the reef to the west, is the wreck of the Korean fishing boat Eikiaki. 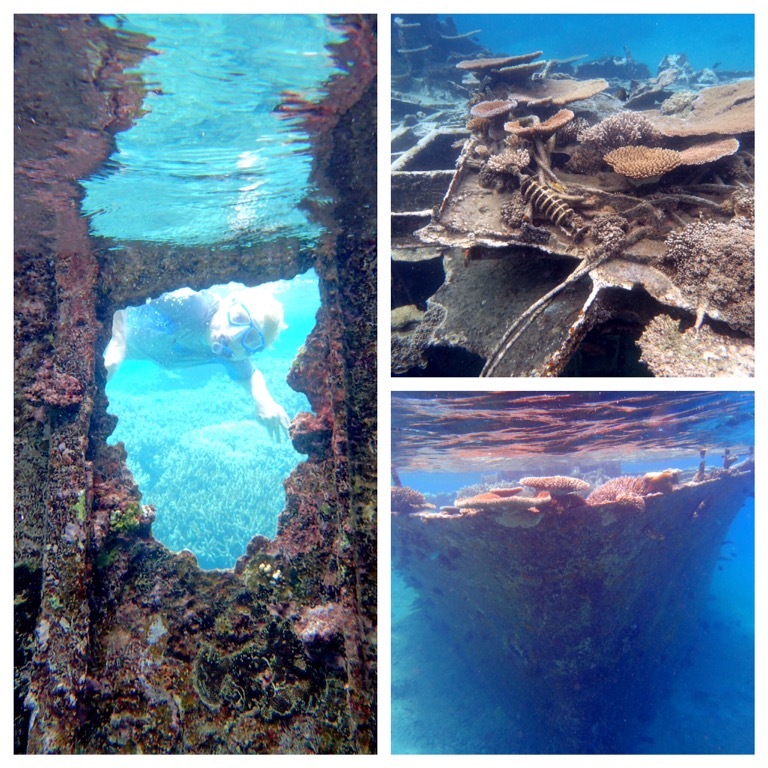 It is marked on our guide as a good snorkelling spot, so we decided to dingy across and investigate.. 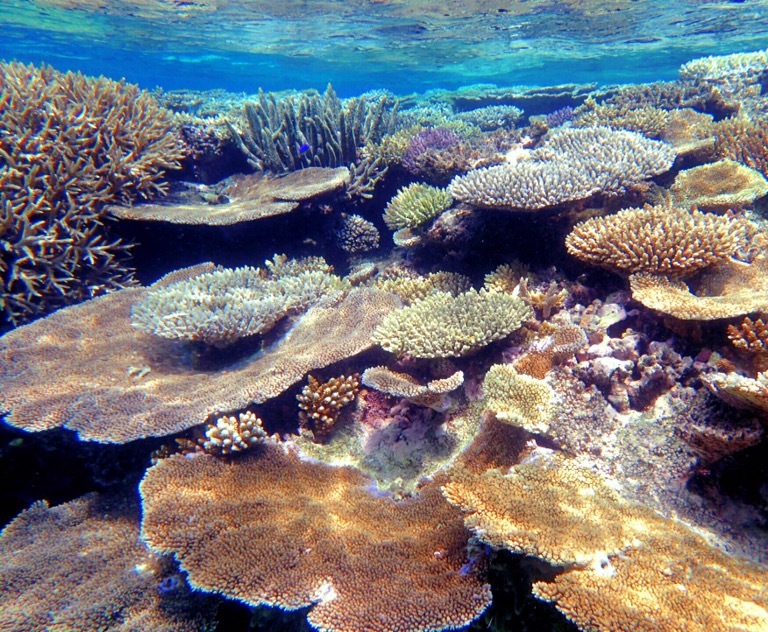 It turned out to be the best snorkelling we had done in Tonga, not just the spectacle of a boat being gradually claimed by the sea but the coral that has been so poor elsewhere, here was very much alive, multi-coloured and multi-structured. The rusting hulk of the Eikiaki sat on the sea floor, its small amount of remaining superstructure poking out of the water. We tied the dingy to a crumbling rail and snorkelled a meter or so above its deck. Fish swam in and out of the hatches and openings into the hold, coral flourished on every surface and old cables wound through the chaos of metalwork. The next morning we moved on to Nomuku Iki, or small Nomuku. A channel runs between the large and small island and winds around extensive reefs. On one side the busy village with ferries and fishing boats dashing in and out, on the other where we were anchored yet another deserted pristine white beach. 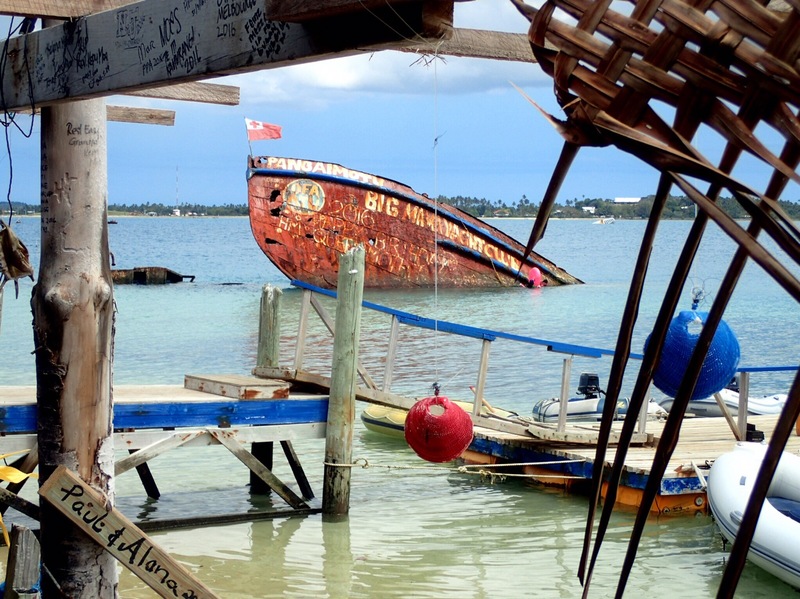 And, we were surprised to find, another wrecked fishing boat. This one sat high up on the sand looking rather like a huge stranded bath tub. Just behind it through a break in the trees was a clearing, a shack, some copra drying racks and fishing nets. Nobody was at home except a huge sow who frightened the life out of us as it appeared suddenly through the thick jungle of trees. 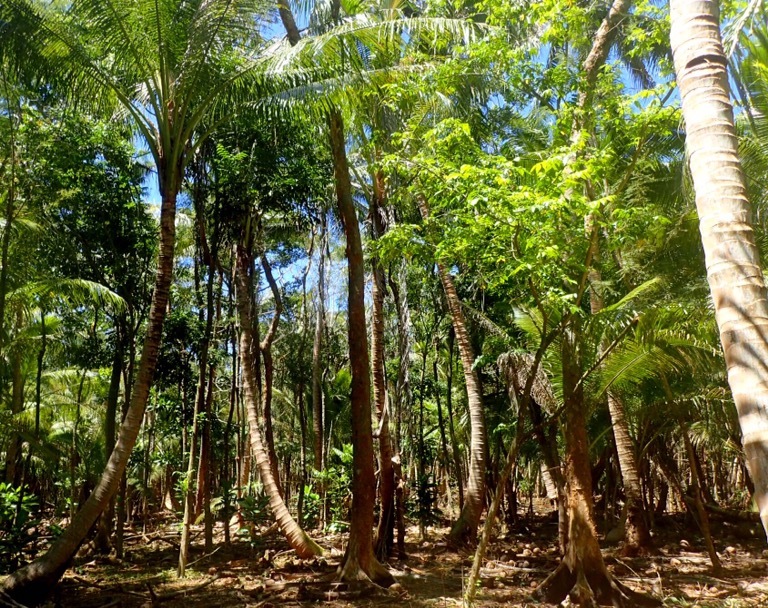 We ventured further in, admiring the long straight trunks of the palms and soaking up the cathedral like atmosphere, until, after just a few hundred meters, all traces of a path disappeared, the floor a mass of coconut husks and the way forward a tangle of undergrowth. Having left the machete at home we turned back. Nomuku Iki was our last desert island for this year as we have now reached Nuku’alofa where we shall prepare for our sail down to New Zealand. It was not however our last wreck, not wanting to quite leave tropical islands behind instead of mooring off the town quay we have anchored, a mile NE off of Pangaimotu and Big Mamas Yacht club. No normal sign above the door here. It seems to have been a week of wrecks. How long will the sail to NZ take? Will you be celebrating your 60th (s) in NZ? Your pictures and stories are wonderful but it seems such hard work! Take care and looking forward to the next instalment ! Thanks Jill, it will take about a week to get to New Zealand but it’s waiting for a weather window to leave that will take he time.